Welcome to The Abso!ute Sound online! We explore music and the reproduction of music in the home. We believe that the sound of music, unamplified, occurring in a real space is a philosophic absolute against which we may judge the performance of devices designed to reproduce music. Our goal is to provide the resources consumers need to judge how a component's sound either honors or departs from the music's truth, and to make sound purchasing decisions that maximize their experience of reproduced sound. Below is our Issue 218, December 2011 table of contents and link to the editorial. We recommend six complete high-end systems starting at $1849. Dr. Charles Zeilig and Jay Clawson report on their groundbreaking project to evaluate and quantify every sonic variable in computer audio. Part One of a four-part series. 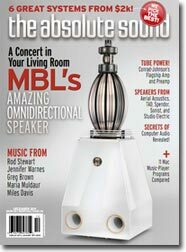 The latest implementation of MBL’s ingenious Radialstrahler omnidirectional loudspeaker technology is the best yet, says Peter Breuninger. 26 Special Feature: Can High-Performance Audio Help the Performing Arts? Jim Hannon on a remarkable new technology that brings high-end audio into the concert hall. With its compact size, audiophile-grade sound quality, and ability to stream music wirelessly, Focal’s new $999 Bird soars, says Chris Martens. Confused about all those music-playing programs for the Mac? Steven Stone evaluates eleven software packages in this head-to-head comparison. B&W adds wireless streaming — and improved sonics — to its now-iconic Zeppelin tabletop music system. Wayne Garcia reports. Neil Gader on a category-defying new component that plays CDs, USB drives, wireless sources, AM/FM, and Internet radio. Our newest contributor, Garrett Hongo, on a highly engaging and affordable loudspeaker from Sonist. Down with flat! Steven Stone reviews a compact, ultra-high-quality mini-monitor with a decidedly different frequency response. NuForce has taken Class D amplification to a new level with its top-of-the-line Reference 18, says Chris Martens. Robert Harley discovers the benefits of ultra-sophisticated isolation devices from vibration-control pioneer Stillpoints. Can an amplifier priced at a thousand dollars a watt be a contender? If that amplifier has the sweetness and delicacy of the Class A Vitus SIA-025, the answer is yes, says Neil Gader. Robert E. Greene reports on the modernization of a classic. This terrific-sounding, beautifully built floorstander hits all the right notes. Kirk Mitdskog on the newest loudspeaker from Aerial Acoustics. Robert Harley lives with a contender for the state of the art in floorstanding loudspeakers. Jonathan Valin on what are, without doubt, the most neutral, transparent, and realistic electronics the venerable firm of conrad-johnson has yet made. Jacob Heilbrunn takes the Alexandria’s performance to another level with the addition of two massive Thor’s Hammer subwoofers from Wilson Audio. 156 HP’s Workshop: Harry Pearson on the new components now gracing his listening room. The outspoken Dr. W of AIX and iTrax talks to Andrew Quint about recording techniques, high-res downloads, multi-channel on Blu-ray, and listening from under the piano. Mark Lehman on a cornucopia for “Type Two” classical music record collectors. Audiophile vinyl reissues of Rod Stewart and Jennifer Warnes, new releases from Greg Brown, Maria Muldaur, Michael Murphey, and Gillian Welch, and new settings of Hank Williams lyrics and Bela Bartók miniatures. Chamber pieces from Marlboro, Christmas tunes from Copenhagen, Bach from Heinz Holliger, and piano music from John Corigliano. The latest from Wadada Leo Smith, Steven Bernstein’s MTO, Satoko Fujii, and Alex Hoffman, along with the first-ever commercial issue of the Miles Davis Quintet’s 1967 live recordings from Europe. Duck Baker selects five stellar albums devoted to the music of Thelonious Monk. Pioneering Karen Sumner, President of Transparent Audio, talks with Neil Gader.